Too much earbud use can lead to hearing loss. Earbuds are ubiquitous these days. But for as much as they are a convenient and efficient method for delivering clear sound to your ears, they can also have a downside in terms of hearing health and the long term negative impact they may have upon delicate sensory cells deep within your ears. This information isn’t new to those of us who work in audiology. Noise-induced hearing loss has been a rising problem for some time now. According to the World Health Organization, nearing half of teens and young adults ages 12 to 25 in middle and high income countries are exposed to unsafe noise levels, typically view personal audio devices. Fortunately, there are at least a few steps you can take to protect your hearing. 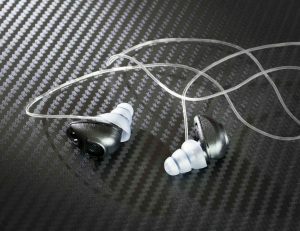 Here are a few tips for avoiding unsafe earbud use. Keep the volume level to a minimum. It’s recommended that you use only 60-80% of the maximum setting on music players and other devices. Limit the duration of your exposure to high levels of sound. Give your ears some rest. Especially for kids, try to avoid exceeding 1-2 hours of daily listening. Upgrade your cans. Choose noise canceling earphones that can block out ambient noise over standard-issue earbuds. Not only are they likely to fit better, but you’ll be less likely to crank up the volume. Keep a pair of earplugs on you. Especially if you’re someone that is frequently exposed to high noise environments, it’s worth investing in a pair of earplugs to protect your hearing. Pay close attention to tinnitus symptoms. Tinnitus is an early warning sign of hearing loss. More and more teens are presenting with tinnitus, so it’s important to keep a close eye on it. Pay close attention to kids. Take note if your kids are listening less or if school performance is slipping. It could be a hearing related problem. Get your ears checked regularly. Many people overlook the need to regularly check their hearing. If you experience other hearing related symptoms like faded sounds, it’s time to make an appointment with your hearing specialist. This entry was posted on Friday, December 9th, 2016 at 9:47 am. Both comments and pings are currently closed.